Exporting palm sugar to Europe? European demand for new and innovative sweeteners that can be used as an alternative to sugar is growing. Palm sugar exporters from developing countries can benefit from this growing demand by stressing its exclusivity and unique origin. Although some consumers consider the relatively low Glycemic Index of palm sugar as a positive property, many consumers consider all sugars including palm sugar as unhealthy. They are most concerned about the high amount of calories in sugar. Which European market offers opportunities for exporters of palm sugar? What trends offer opportunities in the European market for palm sugar? What requirements must palm sugar meet to be allowed onto the European market? What competition do you face on the European palm sugar market? Through what channels can you get palm sugar onto the European market? What are the end market prices for palm sugar? Palm sugar is used as a sweetener by consumers and by the food industry. The palmyra palm (Borassus genus) is cultivated in Africa, Asia and New Guinea. The tree has many uses, such as for thatching, hats, writing material, timber and several food products. Palm sugar is produced from the sap (called ‘toddy’) of the flowers of the tree. The date palm has two species, both of which are used for the production of palm sugar (Phoenix dactylifera and Phoenix sylvestris). P. dactylifera is common in the Mediterranean and Middle Eastern regions, while P. sylvestris is native to Asia and cultivated mainly in Pakistan and India. Date palms are cultivated mainly for dates. The palm sugar is made from the tree’s sap. The nipa palm (Nypa fruticans) is native to the coastlines and tropical regions of the Indian and Pacific Oceans. It is the only palm tree that grows partially in water (mangrove biome); only its leaves and flowers grow above-water. This palm produces a sugar-rich sap that is used to produce palm sugar. The sugar palm (Arenga pinnata) is native to the coastal and tropical regions of Asia and is cultivated mainly in China and Indonesia. The sap used to produce palm sugar is known in India as ‘gur’ and in Indonesia as ‘gula aren’. Coconut palm sugar (Cocos nucifera) is produced from the sap of the flowers of the tree. The coconut palm grows in coastal areas of the Indian and Pacific Oceans. Major suppliers are Indonesia, the Philippines and Thailand. In general, palm sugar is produced by boiling the collected sap until it thickens. The boiled sap can be sold as palm syrup, which is typically sold in bottles or tins and tends to thicken and crystallize over time. The boiled sap can also be solidified and sold in the form of bricks or cakes. Alternatively, the cakes or bricks can be further processed into granulated sugar. Although palm cakes sell well in local markets, European buyers are more interested in granulated sugar. Classification of palm sugar: Harmonised System (HS) code: no separate HS code exists for palm sugars and it is therefore traded under several HS codes, including 1702.9010, 1704.9090 and 1901.9090. See our other studies about honey and sweeteners for more information about the honey and sweeteners market in Europe. 2 . Which European market offers opportunities for exporters of palm sugar? The largest concentrations of consumers who are interested in new and innovative food products such as palm sugar are located in northwestern Europe. Many suppliers of new and innovative food products choose to introduce their product to the United Kingdom first. Other northwestern European countries usually follow later and eastern and southern European countries are often the last to adopt a product. The early adopters in northwestern Europe usually have relatively high disposable incomes (see figure 1) and are able and more willing to pay a premium price for these products. Since Europe does not produce any of the palm sugars mentioned above, it is entirely dependent on imports. Industry sources estimate that the total European market for palm sugar is around 1,500-3,000 tonnes, which is a very small segment of the total sugar market. To compare, the total European sugar market, including cane, beet, molasses and sugars not specified elsewhere, amounted to over 16 million tonnes in 2015. Importers of natural products, such as palm sugar, are mainly concentrated in northwestern Europe, which includes the United Kingdom, the Netherlands and Germany. This is due to greater interest in these products among consumers in this region. See the website of the Export Helpdesk of the European Commission and the trade statistics published by the ITC for analyses of the trade in various sugars. For a broader overview and analysis of European economies, visit the World Bank or IMF websites, which offer data and statistics. 3 . What trends offer opportunities in the European market for palm sugar? The food industry in Europe has started to focus more on natural sweeteners instead of artificial sweeteners. This is in response to a growing group of European consumers who view brown and unrefined sugar as healthier and more natural than white, refined sugar. This shift is due mainly to critical food research which has suggested that synthetically manufactured food products can have a negative effect on health. Though aspartame was originally introduced as a new, ‘healthier’ artificial sweetener substitute for refined sugar, critical research has linked aspartame to health issues such as depression, headaches and autism. Respond to the trend for natural ingredients by promoting the natural properties of your palm sugar. European demand for sugar remains strong. However, the health trend is giving rise to an alternative market for healthier sweeteners. One of the health concerns related to sugar is the glycemic index (GI). Consumption of products with a high GI has been related to many health disorders, for example obesity, diabetes and heart disease. Consumers are looking for products with a low GI. Research has shown that choosing low-GI foods can particularly help manage glucose levels in people with Type 2 diabetes. A low GI indicates that it takes longer to process the sugar and that it results in a slower rise in blood sugar levels. GI is mainly of concern to a relatively small but growing group of consumers, mainly diabetics (9% of the European population in 2015). This group is expected to grow to total 11% of the European population in 2040. In addition, there is a growing group of consumers who are concerned about diabetes without having been diagnosed as diabetic themselves. Palm sugar from Cocos nucifera has a slightly lower glycemic index (54), compared to conventional sugar (60). However, the benefit of palm sugar consumption for managing glucose levels is under debate. The European Union has not approved any health claims on the relation between low-GI palm sugar and managing blood glucose levels. Moreover, many consumers do not see palm sugar as a healthy product. Consumer concerns about the healthiness of sweeteners relate primarily to the level of calories, and this level is high in palm sugar. Promote the exclusivity, origin and natural features of palm sugar to gain more interest from buyers. See our study on trends for honey and sweeteners for more information. Growing interest among European consumers in ethically sourced products provides opportunities for ethically traded palm sugar. Consumers in Europe are increasingly concerned about suppliers and the circumstances under which their product is produced, such as working conditions at factories. The leading standards organisation in the ethical trade market, Fairtrade International, reports significant growth in sales in certain product categories. However, sales of Fairtrade certified cane sugar dropped in 2015. The main cause of this drop is the expected end of European sugar beet production quota management 2017. This shift has already influenced the prices of white sugar and has made it difficult for Fairtrade sugar to compete with cheap European sugar. The price of white sugar is expected to decrease even more until 2017, after which it is expected to remain relatively stable. Consumers are also increasingly interested in organic food products. The organic market increased by 7.6% in Europe between 2013 and 2014. In 2015, Sweden’s organic market grew by 40% in 2015. Most palm sugar is organic by default as palm trees are often cultivated without the use of chemicals. Where this is the case, it is relatively easy to apply for organic certification. Consumer concerns about global issues such as climate change are stimulating European buyers of palm sugars to become stricter in their requirements for the sustainability of palm sugar production. For example, they are increasingly promoting the collection of sap from trees in natural forests as an alternative to cutting down such natural forest. Refer to the International Federation of Organic Agriculture Movements’ (IFOAM) overview of organic sales and trends in Europe. In your promotion, report measures you are taking to improve the sustainability of your production. 4 . What requirements must palm sugar meet to be allowed onto the European market? It is important that you have a clear understanding of the requirements listed above. Moreover, European Union food safety legislation and buyer requirements are of particular concern in the palm sugar market as this sugar is often produced in an environment where producers have little control over hygiene conditions. The General Food Law is the legislative framework for food safety in Europe. To guarantee food safety and allow action in cases of unsafe food, food products must be traceable throughout the entire supply chain. It is important to define critical control points to monitor for any food safety hazards (HACCP). Relevant hazards in palm sap collection and processing include contamination by physical elements (plastic residues, metals and dirt) and chemical elements (cleaning agents). Prevent any contamination of your product to ensure that your palm sugar is safe for consumption. If European companies or authorities find that the safety of your raw cane sugar cannot be guaranteed, they will take it off the market and register it in the European Union’s Rapid Alert System for Food and Feed. Producers with ethically traded palm sugar are currently not able to benefit from the widespread recognition offered by the Fairtrade label in Europe. Because Fairtrade International does not yet have a standard for palm sugar production, it is not possible to certify palm sugar producers. Alternatives to the Fairtrade label are offered by two standards organisations: the Institute for Market Ecology (IMO) runs the Fair for Life certification scheme and Control Union has Fair Choice. Establish a traceability system and keep samples for each from your suppliers to trace the origin of a product in case of non-conformity. Keep your facilities clean by setting up strict operating procedures, such as cleaning schedules for your processing equipment. Search the European Union’s Rapid Alert System for Food and Feed (RASFF) database to see examples of withdrawals from the market and the reasons for these withdrawals. European buyers are particularly concerned about yeast levels. Yeast multiply between the collection and processing of sap. Optimisation of collection practices and storage and transport to the processing site can keep yeast levels in palm saps to a minimum. A lower level of invert sugar leads to a higher quality sap and, ultimately, high quality palm sugar. Since palm sap deteriorates quickly, the initial processing must take place close to the harvesting location. Contamination by polycyclic aromatic hydrocarbons (PAH) is a potential risk in palm sugar production when the palm sap is boiled over an open fire. For more information on contaminants in food, please refer to the legislative requirements. In the Philippines, exporters must comply with the Philippines Bureau of Agricultural Food and Product Standards’ Philippines National Standard (PNS) for coconut palm sugar (PNS/BAFPS 76:2010). The bureau conducts regular inspections of processing plants and storage facilities to ensure the safety and quality of coconut sugar. Compliance with the Philippine standard for coconut sugar is also relevant for exporters in other countries. Due to the lack of an international standard, European buyers sometimes require compliance with the Philippine standard instead. European consumers are mainly interested in sugars and sweeteners that have a similar taste to refined sugar. Palm sugar tastes most similar to refined sugar when it has a relatively high sucrose content (70-80%) and low mineral content (3-4%). The exact level of sucrose can differ per batch of palm sugar, even for the same type. Additionally, the product contains protein (1-2%), glucose (1-8%), fructose (3-9%) and fat (0.5-1%). Use markings on your products to track individual production batches. Be careful not to make health claims relating to the low GI of palm sugar, as European legislation does not allow this. Palm sugar is packed in Kraft paper bags or polypropylene (PP) bags with a polyethylene (PE) inner bag, which protects the sugar from moisture. This is necessary as palm sugar attracts moisture. Buyers may have specific packaging requirements as well. Collect palm sap early in the morning as this leads to a better quality sap. Minimise time between harvesting and processing of the sap. Producers can increase efficiency by cooperating in additional processing steps. Keep tools and facilities clean to prevent contamination and degradation of quality. Prevent contamination by foreign materials. To prevent contamination of your sugar by smoke, use chimneys when heating the palm sap. To prevent yeast from forming, you can smoke the collection containers (such as pots) before use by putting them upside down on smouldering leaves. Clean processing and packaging equipment before packaging the sugar. Protect the sugar from moisture during loading. Keep temperatures and humidity low during transportation by means of good ventilation conditions. Protect the cargo from pests such as beetles and moths. 5 . What competition do you face on the European palm sugar market? Competition for palm sugar exporters comes mostly from companies in the raw cane sugar trade. These products have similar properties. Though raw cane sugar is priced much lower than palm sugar, it is less innovative and also has fewer health benefits. See our factsheet on raw cane sugar for more details on this product. Palm sugar also competes with natural sweeteners such as stevia. This sweetener is increasingly being used to replace sugar. Compared to stevia, palm sugars are expensive and considered less healthy due to their high calorific value. However, palm sugar has the advantage that it does not have the negative aftertaste associated with stevia. Palm sugar production takes place in many different countries. Most imports of coconut sugar and arenga sugar, two products with relatively large consumer markets, come from Indonesia and the Philippines. Palm sugar producers in Northern Africa and the Middle East have a competitive advantage over other palm tree producers because of their proximity to the European market. Do not attempt to compete directly with conventional sugars as this is too difficult. Distinguish yourself from stevia, other natural sweeteners and conventional sugar. Stress the unique selling point of palm sugar: it does not have the negative aftertaste of stevia and is healthier than conventional sugar and other natural sweeteners because of its low glycemic index. 6 . Through what channels can you get palm sugar onto the European market? The largest segment for palm sugars is the consumer market. This segment requires retail-packed palm sugar of high quality. Usually, palm sugar is packed in Europe by importers. They have the required certificates, packaging capabilities and logistical capabilities to supply retailers. Retailers need small and frequent deliveries. Moreover, suppliers need to be able to take back products if a food safety issue is identified. 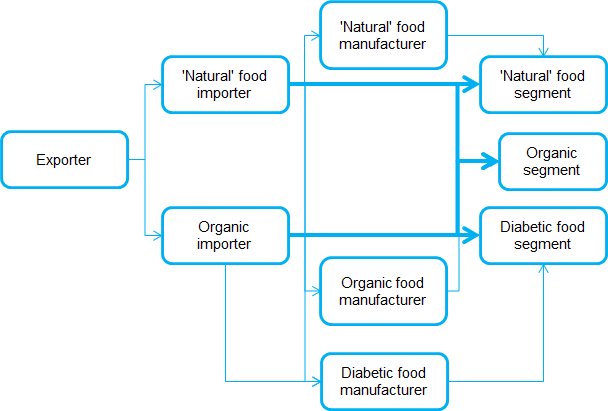 Manufacturers of ethically traded, organic and diabetic products form other important segments. Their products are sold to health shops, retailers focused on organic products and other specialised retailers. Due to the high price of most products containing palm sugar, conventional retailers are only minor buyers of these products. European countries with the highest diabetic populations are interesting markets to promote palm sugar as a sweetener with a low glycemic index (GI). See the trends section of this study for more information on low GI products. See figure 2 for European countries with the highest number of diabetics in 2010. According to the International Diabetes Federation (IDF), the countries in figure 2 are expected to have the largest diabetic populations in Europe until at least 2030. A small share of palm sugar supplies to Europe go to the market segment for gourmet products. Gourmet products are high-quality products with a refined taste and special presentation. They are usually higher in price and targeted at consumers who are willing to spend more money on food than the average consumer. In the leading European markets, most palm sugar is currently being sold as a mainstream product. Although palm sugar is still relatively new and innovative compared to many other sweeteners, its sale is no longer restricted to niche markets. Position your product as new and innovative if you are targeting northwestern European markets. In addition, in certain northwestern European countries such as Germany, France and the UK, you can promote the low GI as an additional feature. If you target southern European markets, position your product as a low GI product for diabetics. See the website of FoodDrinkEurope for information on consumption patterns of various food products, including palm sugar, across different European countries. Focus your promotion efforts on importers that supply directly to end users, such as bakeries or consumer markets. In Europe, palm sugar for the consumer market is sold mainly by specialised retailers, such as health food and organic shops. Join sector associations and cooperatives to increase volumes, benefit from economies of scale and get access to bigger buyers. Inform importers about the opportunities of palm sugar for diabetic foods. For more information, see our study on market channels and segments for honey and sweeteners. 7 . What are the end market prices for palm sugar? Retail prices for the various types of palm sugar are specified in the table below. The prices per kg range between €7.32 and €46.33. See table 1 for more information. To compare, prices for conventional refined sugar are around €0.70 per kg in 2016. Raw cane sugar is priced at around €5 per kg. This shows that palm sugars cannot compete on price with refined sugar and raw cane sugar. They can only compete with other sweeteners in niche segments for natural and healthy products. Retailers specify whether palm sugar is made from coconut blossoms (coconut sugar) or the sugar palm (arenga palm sugar). They can also label a product simply as palm sugar, without specification of the type. For exporters who are able to position their product above other sweeteners, premium pricing is an option. This can be done through organic certification and a good marketing campaign. For such a campaign to work, you need documentation of the product benefits and applications. Use organic certification to obtain a premium on your palm sugar. Reduce fluctuations in the prices of your raw materials by making agreements with your suppliers. Build in price flexibility, but also set minimum and maximum prices for the raw materials. Over the long-term, mutually beneficial agreements can help to prevent large price fluctuations.